We’re on the cusp of a revolution in life-science research. This revolution promises to bring with it better ways to detect cancer and other diseases, as well as a more efficient drug-discovery process. And it promises these benefits on the cheap—thanks in large part to what’s known as microfluidics. Let’s back up for a moment… back to December 29, 1959. It was then that physicist Richard Feynman gave his now-famous lecture titled There’s Plenty of Room at the Bottom, during which he essentially anticipated what we now call nanotechnology. Feynman actually never mentioned the word “nanotechnology” in his talk—and it wasn’t until the 1980s that nanotech researchers began regularly citing his lecture—but what he did do at that time was posit the amazing possibilities afforded by miniaturization, including “miniaturizing the computer.” He foresaw that the clunky “computing machines” of his day would be infinitely more useful if they could be shrunk. By 2011, Intel was mass producing processors with 32-nanometer technology that contained 2.6 billion transistors. Intel’s Xeon server chip that’s due to be released this year has 4.31 billion transistors. And consider that one of today’s smartphones has significantly more computing power than all of NASA circa 1969, when it sent Neil Armstrong and Buzz Aldrin to the moon. While it’s true that we don’t yet have the capabilities Feynman envisioned—of building “a billion tiny factories, models of each other, which are manufacturing simultaneously” from the bottom up, atom by atom—his miniaturization-of-computers idea was clearly spot on. So what if we applied his approach to a different area of scientific study… say biology? After all, much of biology today is similar to where electronics was yesterday—except instead of vacuum tubes and cable wires, you have arrays of test tubes and hoses. What if all that “plumbing” used to study biological systems could be shrunk—would we reap the same benefits as we did in electronics? Turns out the answer is yes. And that’s where microfluidics comes in. Microfluidics is the science of fluid dynamics on the micro scale (i.e., millionths of a meter). We’ll spare you the details of the fluid mechanics at this scale—where things like laminar flow, diffusion, capillary effects, and surface tension dominate—and boil things down to one simple idea: Microfluidics and its application is all about conducting biological experiments and tests with really small plumbing. How small is the plumbing we’re talking about? The channels through which the fluids travel in the devices today are roughly the width of a human hair, and sometimes smaller. If you think you’re not already acquainted with the world of microfluidics, think again. Two very recognizable examples of microfluidic technologies are the glucometer to measure blood sugar levels and pregnancy tests. Basically, we’re talking about precisely manipulating fluids—to do things like blood screening for diseases and single-cell genomic analysis—using a microscale device built with technologies that were first developed by the semiconductor industry, and were later expanded into fluidics due to the benefits that accrue from shrinking things. For starters, miniaturization means lower costs, since researchers require much smaller volumes of samples and reagents to conduct experiments and run tests. There’s also the potential for running multiple experiments in parallel and cutting down on the number of steps required to run them. But microfluidics technologies also make novel tasks possible, like giving us the ability to interact with individual cells. Let’s look at another example to explain further. That’s the latest iteration of the CTC-iChip , created by a team of researchers from Massachusetts General Hospital and Harvard Medical School led by Mehmet Toner. The “chip” is about two inches long, one inch wide, and paper thin. It’s designed to capture what are known as circulating tumor cells (CTCs) to give doctors a way to diagnose and track cancer that is less invasive, cheaper, and more informative than a biopsy. CTCs are shed into the bloodstream by tumors, and their isolation and analysis could lead to early detection of invasive cancers—which is important, because the earlier a patient is diagnosed, the better his or her chances of survival—and help doctors develop better and more personalized treatment regimens. The problem is that these things are rare, typically just 1 to 10 CTCs per billion blood cells. Isolating them has proven difficult over the years. 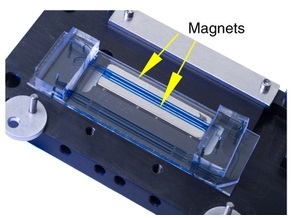 The new CTC-iChip combines multiple technologies like size separation (which takes advantage of the fact that CTCs are larger and stiffer than blood cells) and magnetic-tag separation (which involves tagging white blood cells with magnetic beads so they can be discarded using a magnetic field after the sample is run) to isolate the individual CTCs. Isolating the individual CTCs this way allows scientists to perform single-cell genomic analysis. And that’s important. Consider a cancer biopsy. You can look at the sample and see that the cells are different from one another, yet the way researchers further analyze the sample is by grinding up the tissue and examining the smearing of all the genetic signatures of the different individual cells. This provides you with a rough average of the genetics of all the cells in the sample, but it masks critical differences. For example, the genetics of the metastatic cells are quite different from the cells that won’t spread the disease; with conventional methods of analysis you can’t see that. So you won’t be able to understand what makes the cancer go from a dangerous to a deadly state. By employing single-cell analysis that’s facilitated by this microfluidic chip, physicians can develop a better understanding of the disease, which could lead to more effective personalized treatments. Pretty cool. But it doesn’t stop there. Another new and particularly interesting effort in the area of microfluidics is a play on the well-known system-on-a-chip (SoC) technology from the world of computers. It can be described as human-organs-on-a-chip and could eventually become an invaluable tool that leads to a more efficient drug-discovery process. The idea is not to make replacement organs for transplant, but to replicate enough of an organ’s functions to make the chips useful in testing substances for toxic and therapeutic effects. That has immediate applicability, because a major part of the preclinical phase of drug development involves assessing safety and biological activity in the laboratory—especially in animal studies. (It’s difficult to access reliable figures, but it’s safe to say that billions of dollars a year is spent on animal tests.) The problem with these animal models—without even touching on the various potential ethical issues involved—is that, although they have historically been one of the most trusted tools in drug development, they are not actually all that predictive of the human situation. Not only do animal models fail to identify numerous drugs that are toxic to humans, they also derail drugs that would have been efficacious. Of course this makes sense. Different animals evolved differently and have different biologies. Nevertheless, we continue to rely on expensive, time-consuming, and unreliable animal models in the drug-development process because they’re the best we have. But thanks to advancements in microfluidic technologies, human organs on chips could be a better way. The breakthrough in this area came in mid-2010, when researchers from the Wyss Institute for Biologically Inspired Engineering at Harvard announced they had successfully developed a lung-on-a-chip. The device, which is about the size of a rubber eraser and is made using human lung and blood-vessel cells, actually mimics a living, breathing human lung. It’s essentially a porous membrane with human cells from the lung’s air sac on one side and human capillary blood vessel cells on the other side. There’s air flowing through the channel on the lung side and a medium (like blood) with human blood cells in it flowing through the channel on the capillary side. The whole thing stretches and relaxes like our lungs do when we breathe. And it does a good job replicating the natural responses of living lungs to various stimuli. Just as the living lung-blood interface recognizes invaders such as inhaled bacteria or toxins and activates an immune response, so too does lung-on-a-chip. The researchers tested this by introducing E. coli bacteria into the air channel on the lung side of the device while concurrently adding white blood cells to the channel on the blood vessel side. The lung cells detected the bacteria and, through the porous membrane, activated the blood vessel cells, which in turn triggered an immune response that ultimately caused the white blood cells to move to the air chamber and destroy the bacteria. Lung-on-a-chip was just the beginning. The Wyss Institute also has kidney-on-a-chip, bone-marrow-on-a-chip, and gut-on-a-chip—a silicon polymer device about the size of a flash memory stick that mimics complex 3D features of the human intestine. All could prove to be valuable diagnostic tools in the development of safe and effective new therapeutics. The Wyss team’s ultimate goal is to build 10 different human-organs-on-chips and link them together on an automated instrument to mimic whole-body physiology. This could eventually lead to personalized chips that could predict a specific individual’s drug response. The bottom line: In theory, since these microfluidic human-organs-on-chips use human cells and mimic both the mechanics and biology of the organs they represent, they would be more predictive than animal models, so drug failure rates would be lower. Modeling with these chips would cut costs and reduce the time involved in the drug-discovery process. It’s still too early to tell how successful this field of research will be… but the prospects are exciting. Microfluidic technologies for many applications like this are still relatively early stage, but the above examples demonstrate how microfluidics should play an increasingly important role in disease detection and could ultimately disrupt the drug-discovery process for the better. This kind of game-changing technology is what we at Casey Extraordinary Technology specialize in finding and investing in. From cutting-edge biotech drug companies and molecular-diagnostic innovators to the firms that created the 3D printing industry and those that are building the smart grid, the track record of our investment recommendations stands out among all our competitors and truly speaks for itself, with an average gain per closed position during 2013 and 2014 of 66%.